In the year since Oprah passed away, Jude Judy has taken over the top spot for daytime tv ratings. Of course we were all sad to see Oprah go. There’s no doubt that she is up in heaven suggesting to God design ideas and weight-loss tips. 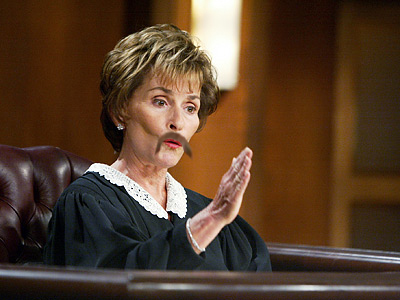 Judge Judy, who makes a reported $45 million a year ($45 MILLION A YEAR!!!!) had no problem taking in Oprah’s viewers, made up mainly of lonely housewives and people who leave the television on for their animals when they go to work. This entry was posted in What If They Grew A Steesh... and tagged daytime tv ratings, entertainment, Humor, Judge Judy, Moustache, mustache, Oprah, television, TV on June 19, 2012 by Los Bulls. Hahah, this just made my day a little bit better.